Last month, I revealed the bag styles I can't live without (clue: they're practical and pretty), so with winter finally here, I thought it was time to tell you about the shoes that carry me through the cold months. If you've read my previous articles, you'll know that my approach to accessories is strictly minimalistic (well, for a fashion editor anyway). Well, the same principle applies to my shoe collection. Like my bags, I need shoes to tick both the functional and fashionable boxes. They have to be comfortable enough to wear all day, go with most things I own, be durable but also look the part (aka not appear too orthopaedic). This means that boots and chic flats end up making up a large part in my winter wardrobe. I'd say four out of five of my choices are timeless pieces that can be worn season after season, but I couldn't resist throwing in my favourite snakeskin boots. Yes, they might be on the more trend-led end of the spectrum, but sometimes you need those personality pieces to add interest to a simple outfit. Oh, and they bring a smile to my face, and that's what fashion's for, right? Scroll down to see and shop my capsule shoe wardrobe. I hadn't considered knee-high boots until I invested in this Zara pair last winter. For some reason, I didn't think they would be very practical (also, I was never a huge fan of the knee-high boots over jeans look), however, they've been my saving grace when it comes to the "what to wear with midi skirts and dresses in winter" conundrum. I purposefully chose a pair with a chunky heel and rounded toe to make them easier to walk in. 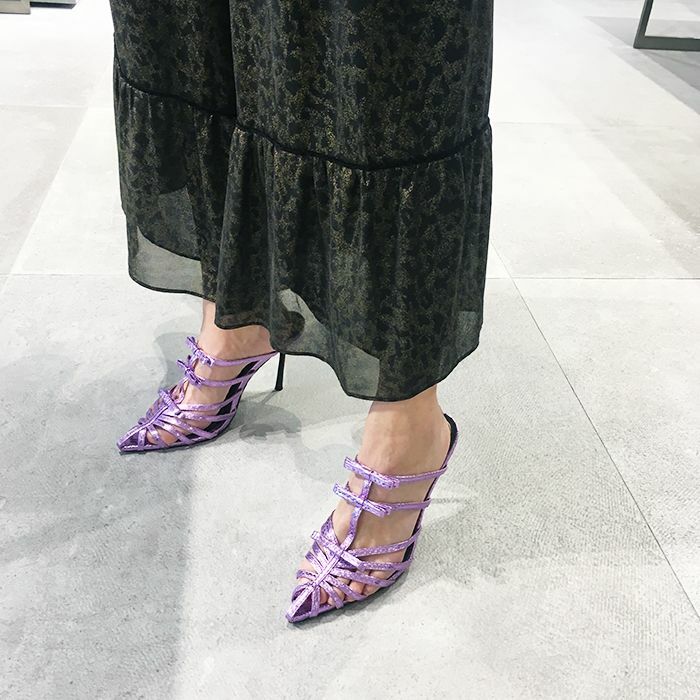 Although I was slightly ambivalent about this season's snake-print trend, these Topshop ankle boots caught my eye with their low Cuban heels and Western details. Despite their a standout print, they go with so many outfits and are perfect for elevating wardrobe staples, such as jeans and a blazer. Chelsea boots are my failsafe shoes for weekend casual. They're comfortable, neutral and versatile and I've worn them with everything from polka dot midis to utilitarian boilersuits. Also, like trench coats, white shirts and LBDs, you know they'll never go out of style. While they're not my number one shoe choice (I'm generally more of a "smart" dresser), I find that a pair of Nike trainers is an essential addition to my wardrobe. Sometimes you need that certain something to dress down an outfit—whether it's a suit, black trousers or floaty frock. A pair of white sneakers is ideal for toning down any corporate undertones. Not sure what shoes to wear with your work winter wardrobe? In my opinion, you can't go wrong with black loafers. I wear this Jigsaw pair at least twice a week for work, as they're smart but not too boring. Also, I think loafers are the best match for a minidress and tights (boots can sometimes shorten the legs).